^ 上海磁浮優化案仍引爭議有公眾稱健康已受影響. 新華網、法制日報. 2008年1月17日 [2013-10-01]. ^ 3.0 3.1 日本新型磁浮列車創造時速603公里世界紀錄. "香港電台". 2015-04-21. ^ 4.0 4.1 時速飆破600 日本磁浮列車再創紀錄. 中央通訊社. 2015-04-21. 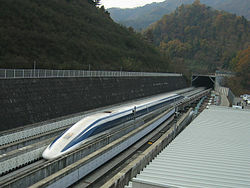 ^ The Superconducting Maglev Sets a Guinness World Record for Attaining 581km/h in a Manned Test Run. Central Japan Railway Company. 2004-03-01. （原始内容存档于2009-06-25）. ^ Ireson, Nelson. Dutch university working on affordable electromagnetic suspension. MotorAuthority.com. 2008-11-14. ^ Ogawa, Keisuke. Hitachi Exhibits Electromagnetic Suspension System. techon.nikkeibp.co.jp. 2006-10-30. ^ Cotsalas, Valarie. It Floats! It Speeds! It's a Train!. New York Times. 2000-06-04. ^ A New Approach for Magnetically Levitating Trains—and Rockets. llnl.gov. [2009-09-07]. ^ Richard F. Post. MagLev: A New Approach. Scientific American. January 2000. （原始内容存档于2005-03-09）. ^ The Pennsylvania Project. [2007-09-25]. ^ SANDAG: San Diego Maglev project. [2008-05-23]. ^ Atlanta Chattanooga Maglev. [2008-08-04].